Improvisation can be described as a “sudden” creation, a spontaneous moment of inventivity that can appear in mind, body or spirit as inspiration. Improvisation in every aspect of life and in any form of art mainly manifests itself when practiced to encourage creative behavior. This practice implies the use of intuition and a technical understanding of the abilities needed for the field where someone improvises. The method we use is an interactive one, consisting of diverse individual and group theatrical exercises, generically entitled games. The game develops the ability to enjoy life being in itself a great source of joy. Play encompasses social values more than any other human activity. The essence of game develops social adaptability, mental and emotional self-control, ethical values, imagination and creativity. A module consists of one weekly session which lasts 120 minutes for groups comprising a minimum of 10 participants. The duration of a module is from 4 to 6 months. Our theater classes are a way to self-discovery and personal improvement. 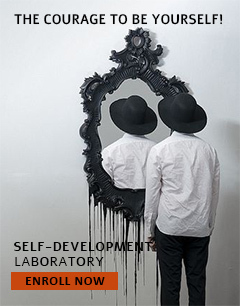 These classes are designed for those who wish to improve their ability of becoming more conscious of themselves, to broaden their own perception of reality and their reactions to others, implicitly strengthening their decision making skills in their daily lives. The activity that unfolds during our classes opens up the possibility to self-discovery and the development of each individual’s personality by means of “instruments” which are specific for the dramatic arts, namely for actors, regardless of our students field of activity, their initial level of preparation, their temperament or cultural level. Because you are consistently confronted with challenges in today’s social and professional environment. It is important that you develop your ability to act and react spontaneously to any such provocation, and perfect yourself incessantly. Because each individual must constantly question the paradigm they are using and exercise their creativity in order to remain competitive. If we have convinced you, enroll here in our improvisation workshops!